Max Kelley, center, is joined from left by his father Mike Kelley, brother Jack Kelley and best friend Josh Johnson. On Feb. 13 they helped put the finishing touches on the bridge Max built for his Eagle Scout project in Pattison Park. OWENSVILLE (Feb. 21, 2018) – In a time when a lot people are talking about walls, Max Kelley built a bridge. 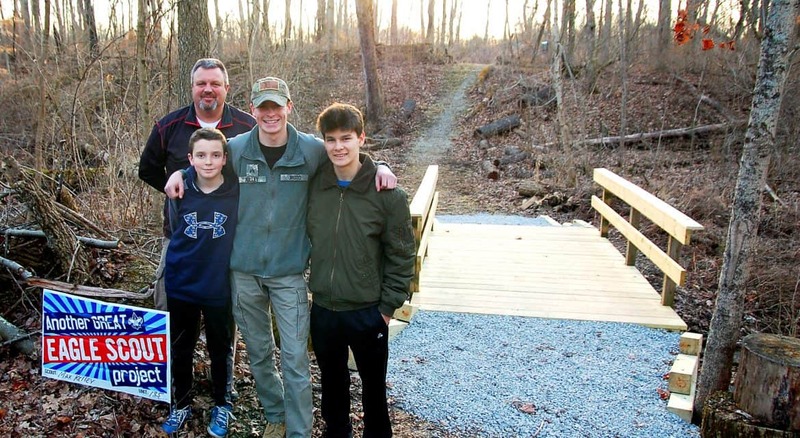 The 15-year-old Milford High School sophomore designed and built the structure on the sugar bush trail at Pattison Park for his Eagle Scout project. He’s been part of Troop 135 out of St. Veronica in Mt. Carmel since first grade and said Scouting provided relief from the bullying he received in grade school. From the age of 8, Max has had a goal to serve in the U.S. Army as an officer. He hopes reaching the rank of Eagle Scout will help set him apart as pursues a college career at either West Point or The Citadel. His service started with a love for the Clermont County Park District. Working with Park Director Chris Clingman to identify a need at Pattison, Kelley began his Eagle project last spring and put the finishing touch – handrails for the bridge – on his creation Feb. 13. Kelley agreed there were challenges. His first build day – with about 20 family members, friends and fellow scouts as volunteers – resulted in a productive effort, but revealed some flaws in the design that needed to be corrected. Several other attempts to build were foiled by weather. All part of the demanding Eagle Scout process. Fewer than four percent of all Boy Scouts attain the rank nationally. Kelley raised the money for the project – eventually about $1,100 in materials like lumber, concrete and gravel – including a $500 donation from RiverHills Bank. His father, brother and best friend were on hand to help install the handrails.